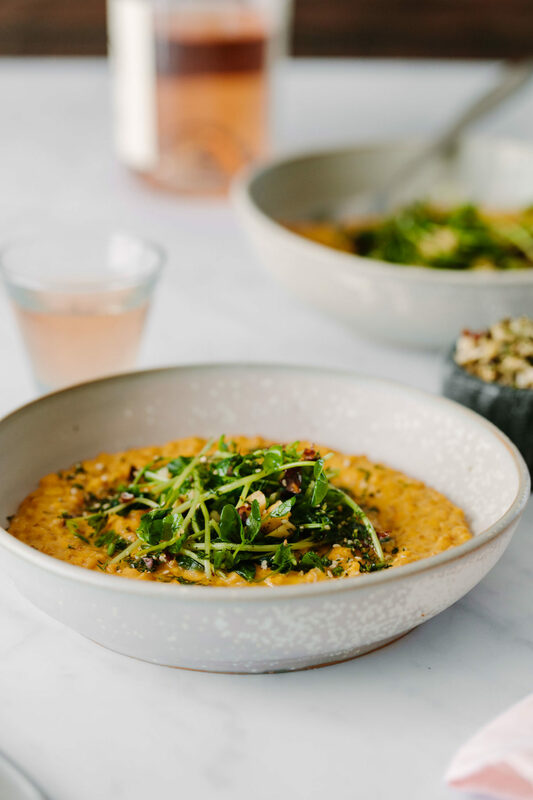 Sunflower Carrot Risotto with Hazelnut-Pea Shoots | Naturally. This dish rings in spring in the best way possible. 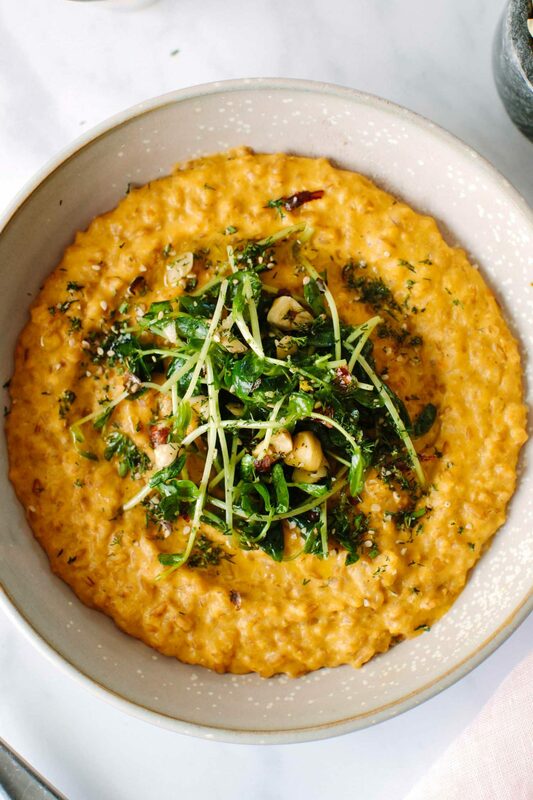 A creamy carrot-sunflower puree helps keep the risotto vegan while the fresh pea shoots bring the greens. 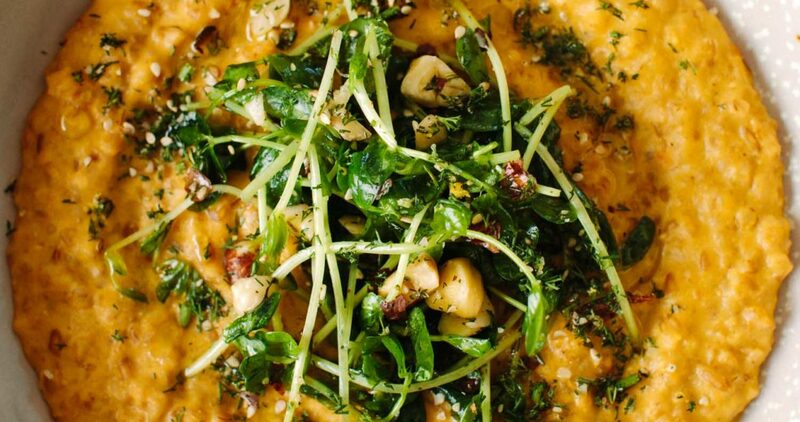 While I love making a delicious, cheese-based risotto, there’s something magical about taking this classic dish and making it vegan. My first attempts were alright but as time goes on, I find a few more tricks to make a delicious dish without one ounce of cheese. This might be a bit like cheating but it gets the job done. Traditional arborio rice releases starch, which is where some of the creaminess comes from. Whole grains don’t quite act the same. However, if you pulse the grain in a food processor or blender a few times, you get a bit of grain dust. This dust turns into the thickening agent in the vegan risotto. The best part about this: it’s a formula you can use with many different grains. I’ve found this works well with spelt, einkorn, farro, and barley. I’ve also had success with using whole oat groats (although I find the texture to be a bit gummier than the others mentioned). In the realm of alternative dairy choices, sunflower seeds are still relatively not used. Sure, you could use almond, cashew, coconut, soy, or oat but I really love the cheapness, ease of use, and flavor of the sunflower seeds. Sunflower seeds puree smooth with relatively little soaking time. Of course, you don’t have to feel obligated to use sunflower seeds. 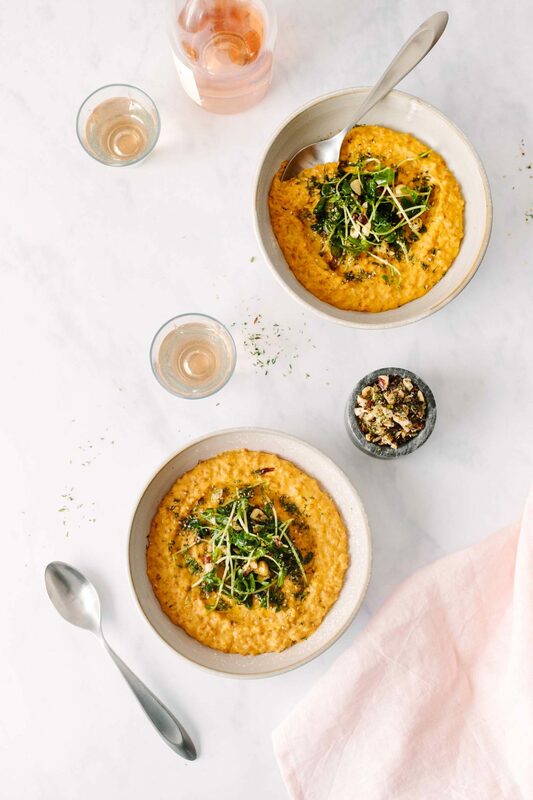 Cashew cream, almond cream, or even something like this millet cream could work (although it’s rare that I double down on two grains in one dish unless I’m making a pilaf). Also, I’m a bit of a carrot lover and they cook tender in the broth. You could, however, use squash puree, sweet potato puree, or I’ve been know in the summer to use a homemade version of creamed corn. I realize this recipe is more involved but it’s worth it. Once you get the risotto going, the topping comes together quickly. 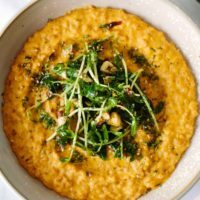 For the ultimate spring risotto, I love using the pea shoots. I feel like the shoots are everything wonderful about spring: fresh, tender, and vibrant. Add to that the dill and hazelnuts, it’s a winning salad-like topping. You could also use sunflower seeds in the topping but I like the flavor and crunch of the hazelnuts. My second choices would be almonds slices. About an hour before starting the meal, place the sunflower seeds in a bowl and cover with water. When ready to start, get the broth going. Place the 4 cups broth and 3 cups water in a saucepan. Bring to a boil then add the carrots. Reduce the heat and let simmer until the carrots are tender. Once the carrots are tender, use a slotted spoon to remove and keep the broth at a simmer. You can start the risotto while the carrots are cooking. Heat a dutch oven or large, high-sided skillet over medium-low heat. Peel and mince the shallots. Add the oil to the pan, followed by the minced shallots. Cook until the shallots are tender then add in the cracked farro. Toast the farro for about a minute then add in 1 cup of the simmering broth. Let the risotto cook until nearly all the broth has been absorbed. Add another 1/2 cup and let absorb again, repeating the add broth/let absorb, stirring frequently, until the farro is just about tender, about 40 minutes. You might not use all broth/water- just taste along the way until the farro is tender. Also, this is a good time to add a pinch of salt if the farro is tasting a bit bland (this will depend on how salty your broth is). When the carrots are done, drain the sunflower seeds and place in a blender along with the carrots, ¾ cup water, lemon juice, zest, and salt. Puree until smooth, adding more water as needed to blend smooth. The puree should still be thick and creamy. Taste and adjust salt if needed. While the risotto still cooks, place the dill on a cutting board. Zest the lemon on top and sprinkle on the sesame seeds. Chop the dill together with the zest, seeds, and salt until it forms a gremolata-like texture (everything should be well blended together with no big pieces of dill left). Place 3/4 of the sesame mixture in a bowl and set aside the remaining 1/4 (you can use this as the final garnish). Place the hazelnuts on the cutting board and chop into smaller pieces. Place in the bowl along with the dill mix. Add the olive oil and stir to combine. Add in the pea shoots and toss until everything is well combined. Finally, once the risotto is tender and most of the liquid has been absorbed, stir in the carrot cream and cook until it’s warm. Remove from heat, divide into 4 bowls, and top with the pea and hazelnut mixture then finish with a final dusting of the reserved sesame mixture. To crack the farro, blitz in a blender or food processor a few pulses. Around half the grains should be cracked and a bit of dust should have formed around the sides and bottom of the blender. Also, you can use whole grain farro. You will need to have a bit extra broth ready and about 20 to 30 minutes longer.